Cedar waxwings photographed by Yuhei Iida (top), Christian Kelly (middle left), Josh Silberg (right), and Jennifer Walker (bottom left). Note the red wing tips visible in the bottom right image. 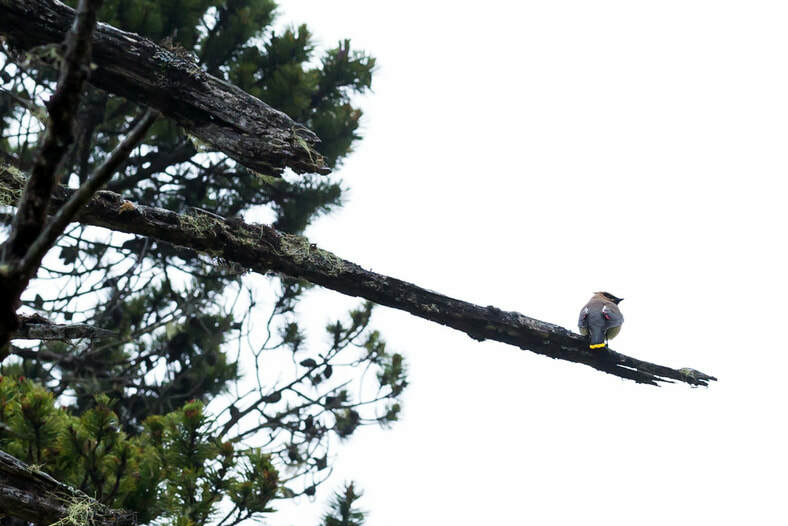 This distinct bird has a lemon-yellow belly blending into orange-brown around the breast, throat, and head. A tuft of feathers juts out the back of its crown. A black blinfold-like stripe, outlined in white, runs across its eyes. Its grey wings are tipped with red (not always visible), and its tail is broad with a squared-off end tipped with yellow. Juveniles have yellow-tipped tails but are streaked brown and yellow all over. 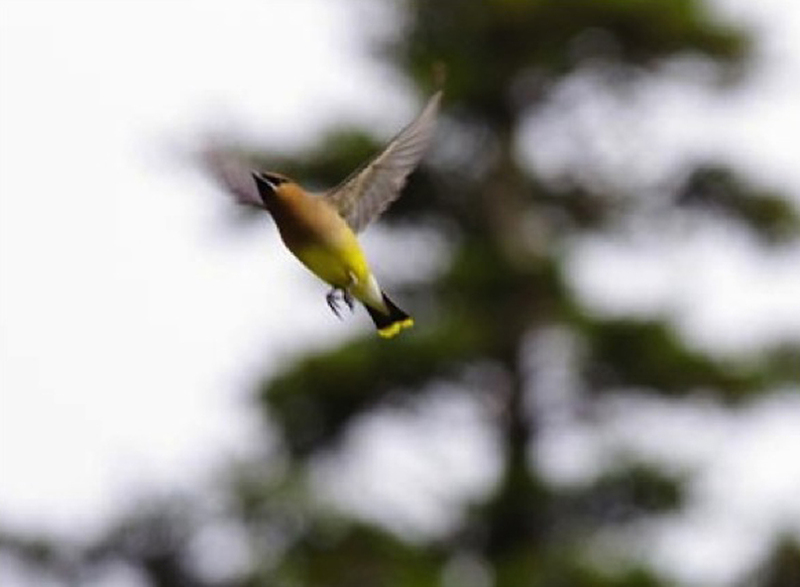 Cedar waxwing sounds are all quite high-pitched, and the species can usually be heard before it is seen. This species is often found in large groups. It inhabits open wooded areas, and seeks out edge habitats with fruiting trees and shrubs for breeding grounds. Such habitats include forest edges, streamsides, fields, and swamp edges. It only ranges north to the Central Coast in the summer months and is found further south for the winter, sometimes all the way to the north edge of South America. Resident populations exist just south of the Canadian-American border. It is found in most areas of North America at varying times of the year (see range map). The bohemian waxwing (Bombycilla garrulus) is quite similar to the cedar waxwing, but is somewhat larger and much more grey. Unlike the cedar waxwing it has white and yellow it its wings, and the underside of its tail is a cinnamon or rufous red colour. 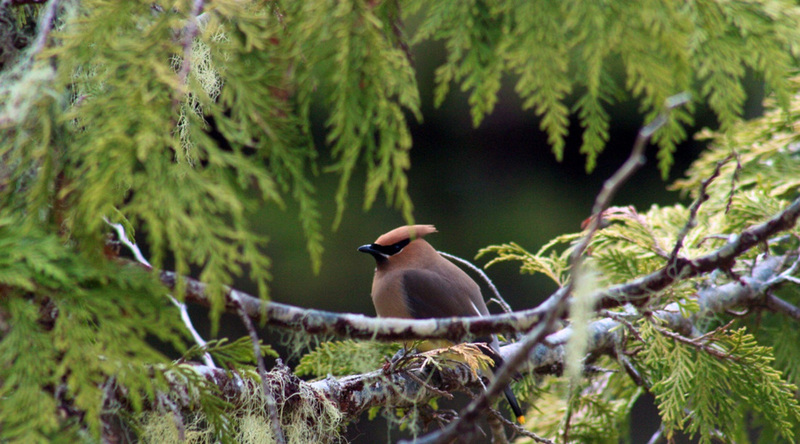 Waxwings are named for their red waxy wingtips. This waxy quality is the result of a secretion produced by birds - the exact purpose of which is unknown, though it may relate to attracting mates. Cedar waxwings eat fruit year-round, and unlike many birds they can survive on a fruit-only diet. 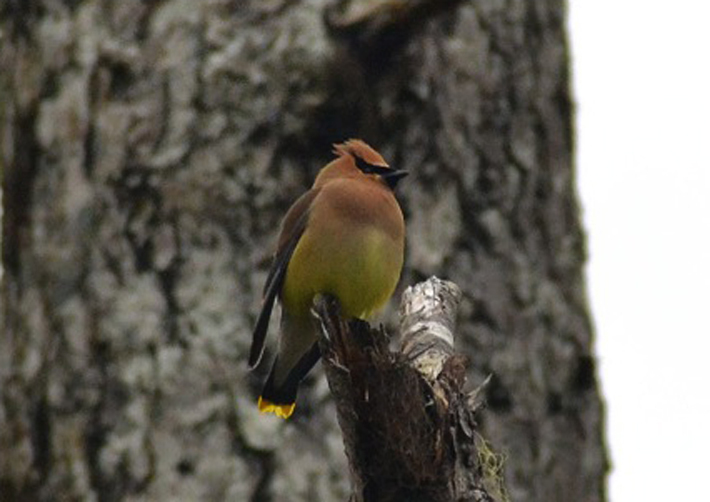 Cedar waxwings can become intoxicated from fermented, overripe berries. Cedar Waxwing Bombycilla cedrorum. Audubon Birds. National Audubon Society. Accessed 20/03/2015. Cedar waxwing (Bombycilla cedrorum). The Birds of North America Online (A. Poole, Ed.). Ithaca: Cornell Lab of Ornithology; Retrieved from the Birds of North America Online. Accessed 01/03/2013. Dunn, J. L. and Alderfer, J. (Eds.). (2006). National Geographic Field Guide to the Birds of North America. (5th Ed.). Washington, D.C.: National Geographic Society. Pp. 372-373.